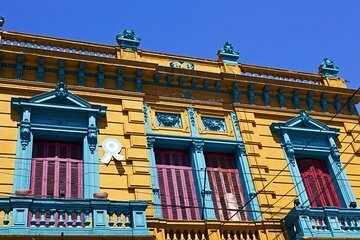 Capture the magic of Buenos Aires on camera with the help of a professional photographer on this 4-hour small-group photography tour. This fun and unique sightseeing tour includes a 30-minute photography class and a photography-inspired tour of one of the city’s vibrant neighborhoods. Snap memorable photos of the colored houses of La Baca, the colonial streets of San Telmo or the modernist landmarks of Puerto Madero, then meet up with your fellow photographers to share your work. Best of all: this tour is suitable for all skill levels and camera types, including iPhones. Tour departs from a central meeting location. Exact address will be given upon reconfirmation. It would help to know WHERE the tour is meeting without my sending 4 emails requesting this information and then finally the day before (while we are in the country with spotty service) get an address for a location in a difficult neighborhood and IT WAS WRONG!!! We stood around and a group of 6 people showed up and we eventually saw someone who looked like she was going in for a photo session. We did NOT meet at a café (where I thought I would eat lunch early) and we were unescorted throughout the photo shoot. We were on our own with a map of the neighborhood and some suggestions about photographing creatively. The person who gave us the 1/2 hour overview of shooting tips was good but that is all that was good. This is not an acceptable way to run a tour offering. If you enjoy photography, this was a fun and great way to spend an afternoon in B.A. !